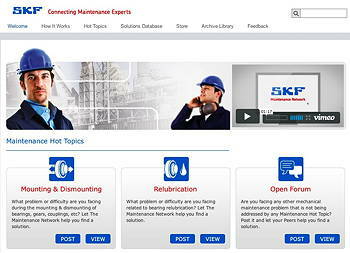 SKF today launches the SKF Maintenance Network, a web site that enables maintenance professionals to connect with other maintenance experts globally and get their feedback on specific problems and find potential solutions. The SKF Maintenance Network is a unique, fun and rewarding way to solve problems. In today’s ever challenging business environment, increasing uptime in manufacturing operations can make the difference between staying competitive and struggling to survive. Consequently, maintenance departments play a crucial role in finding fast answers to equipment breakdowns and thereby minimizing downtime. Every hour of downtime is costing a lot of money to the company and causes high stress levels. In many cases the fix is a partial solution that allows production to go on and the real problem is not tackled until the next maintenance shutdown. But then a more long lasting solution needs to be found, and it is here that the new SKF network service may be able to help. The SKF Maintenance Network offers an incentive to the participation of solution providers by rewarding them with points. These points can be used to obtain various prizes at the network’s web store. The web site includes discussion rooms where people can discuss hot topics as well as specific problems and take advantage of the available expertise and solutions around one specific maintenance topic. SKF will regularly introduce different hot topics where maintenance experts can post their problems and/or help other peers. At the end of every such topic, top solution providers will be announced.